As I mentioned, I went to Iceland in October of 2016. I distinctly remember sitting on my couch and in a fit of unemployed directionlessness, I spotted an ad on Facebook boasting round trip flights to Iceland for cheap. Very unlike my over-analyzing self I bought a ticket and immediately texted Paul, “So I’m going to Iceland in October by myself! Just booked it!" Long story short, he got jealous and bought a ticket so he could spend half the trip with me. Outdoor lovers paradise. Other-worldly landscapes. Super nice people. Easy to navigate. Many people speak English. Trolls, elves, and more. Waterfalls. Icelandic ponies. Black sand beaches. Thermal baths. City life. Glaciers. Geysers. Game of Thrones filming locations. Hot dogs. As for when to go to Iceland? It depends on what you’re after! If you want those long, long (long) days of sunlight: go in the summer. That’s also peak tourist season, so it will be crowded BUT everything will be open and hopping. You could also head there in the winter months for some serious glacier-style loving and Northern Lights watching. Weather.com assures me that even the coldest months still have highs hovering around the high thirties (at least in Reykjavik), so it’s not even THAT cold. October was PERFECT for me. I could still walk around in a flannel and a vest and not freeze my buns off. It’s right in the beginning of the time for Northern Light hunting, which was a total dream. Just bring a rain jacket. Flights to Reykjavik, Iceland are becoming increasingly popular from the United States. The whole reason I went to Iceland in the first place was because IcelandAir was having a sale out of Newark, NJ for under $400 roundtrip. A quick Skyscanner search shows that you can probably get pretty close to that (at least out of the East coast). Iceland stopovers are also a popular way to stop on this magical island. I believe you can stay up to seven days and continue on to Europe for the same cost. IcelandAir doesn’t fly out of your home airport? Check out WOW air too! Plus they’ve got a great color scheme to their flight attendant outfits. And planes. Most flights I can find fly overnight and land you in Iceland bright and early in the morning, so get ready to hit the ground running! And maybe pack some melatonin if you can’t usually sleep on planes. You could base yourself in Reykjavik and just take some day trips, but I highly recommend grabbing a mode of transportation you control yourself. The most popular option you see on Instagram is to grab a camper van. I also have a rad group of friends that just bike toured Iceland. Me, personally? I went with a regular ol’ rental car. The first half of my trip I was solo traveling and though I REALLY wanted to rent a camper van, it was a little out of my budget. Just keep in mind, if you want to hit the Highlands - that regular ol’ rental won’t cut it. You need a 4x4. If you're road tripping, you're going to need to buy these. Trust me. Regardless - make sure you budget for gas. That was super costly. But here’s what I really want to shout from the rooftops about road tripping in Iceland: stop listening to bloggers. Ahem. What I mean to say is something along the lines of “you do you.” Everything I read before I left said “don’t do the Ring Road with any less than ten days!” “If you have a short trip, stick to the Golden Circle.” I say, if you want to go for the whole freaking Ring Road, you GO FOR IT. I separate my trip in two categories: solo time and with-Paul time. When I was by myself (3 days), I did the Snæfellsnes peninsula up on the west coast and the Golden Circle. Once Paul showed up (5 days) we were going to do the South coast of Iceland. And then last minute decided to go the whole way around the Ring Road. If you decided to go the camper van route, this is a much easier step for you…because you’re going to camp in your van, of course! Iceland is pretty relaxed about where you can camp. In many places you can do it right on the side of the road! If you decided to go another route and you need somewhere to sleep, for the most part you are going to go guesthouse style, even if you book places through AirBnB. The curious thing I found when booking my places was that one person seemingly owned 40 (okay, 4-5) rooms in the same town. And that’s because most of the places I stayed ended up being guesthouse style. I have a couple of places I want to highlight as places I’d stay again. And hey, if you want to snag them on AirBnB and it’s your first time using the site be sure to use my referral link for some money off your stay! This AirBnB is on a farm in the Snæfellsnes peninsula. If I remember correctly, there are two rooms and I can tell you there are at least two beds in one of the rooms. It’s a short walk to a beach, you can spend some time with the animals, and it’s super close to one of Iceland’s national parks. BUT the host, Þórunn, is so lovely and she had tons of stories to share about teaching Icelandic children and Icelandic folklore. Borgarnes is a seaside town that isn’t too terribly far from Reykjavik. It’s a good stop off of the Ring Road and this AirBnB led to some pretty great conversations and relationships on my trip! They do have this room linked, as well as a larger house if you happen to be traveling with a large group of people. Their cafe is really lovely too. My favorite AirBnB of the whole trip! Stina’s place is near lots of hot springs, a delicious bakery, and is an easy stop off of the Ring Road. Plus she has an adorably fluffy and lovely golden retriever who I snuggled with for most of my trip. Highly recommend a stay with Stina! We had some great chats about the future of Iceland now that its a huge tourist destination and she really got me thinking. Iceland is a very “see it and pull over” type of place, especially if you’re following the path of the Ring Road. It has signs with different “attractions” on them and you kind of just…pull over and check it out! It could be a hike, a pretty church, a waterfall (you’ll be looking for words that end in -foss), or a ton of other things. I did not come armed with a guide book, but mostly followed this technique. I also have a tendency to do things that my AirBnB hosts suggest, so that helped to. Golden Circle - This itinerary is one that popped up over and over again as I was doing research for Iceland. It’s a pretty easy day trip from Reykjavik and the driving isn’t intense at all. The three most popular stops include Þingvellir National Park (complete with snorkeling between some tectonic plates! 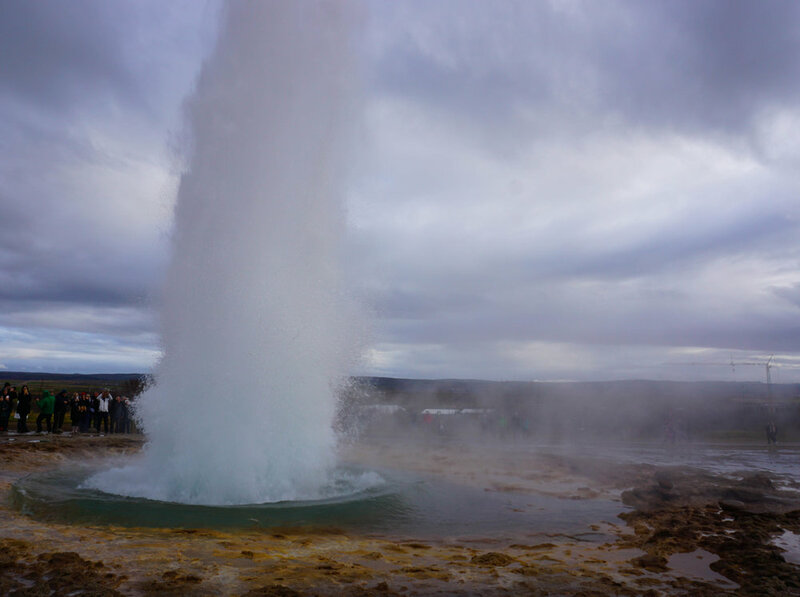 ), some famous geysers (the appropriately named Geysir and Strokkur), and the Gulfoss waterfall. Geysir doesn't actually do this anymore, but Strokkur does! And take note - you only see a hint of the crowds in this picture. Chased Waterfalls - If you’ve seen TLC-inspired captions on my Instagram, they’ve most likely been from Iceland. There are a billion (plus or minus a few) for you to see and explore. Some of the most popular are Gulfoss (part of the Golden Circle), Skogafoss (you can hike up above it and camp below it), and Seljalandsfoss (which you can walk behind - bring your raincoat!). Seriously, A. TON. of them. Explore and find your favorite! Hot Baths - Honestly, this is probably one of my favorite parts about my Iceland trip. I did skip the Blue Lagoon, and I would probably skip it again if I went back. It was more fun for me to experience the secluded hot baths. If you’re headed to the south coast, we went to Seljavallalaug. It’s got a pretty short hike to it and it was pretty secluded first thing in the morning. Up north, there is Grettislaug. It’s nestled in between the water and the mountains, so it’s got some seriously beautiful views! It looks like it might get crowded sometimes, but definitely wasn’t in October! And if you’re doing the Golden Circle circuit, you can stop by The Secret Lagoon. It’s not-so-secret (and not-so-free), but it’s a lovely pool and it’s got a bunch of history associated with it as it is the oldest pool in Iceland! Beaches - Yup, beaches in Iceland! So many beaches. So many different sand colors. Not enough time. I would hedge a bet that the most popular beach to visit is near Vik in the south part of Iceland: Reynisfjara Beach. It’s got black sand and there were a TON of people there when we visited. If I ever go back I am all over Jokulsarlon Beach (icebergs and black sand!) and Nautholsvik Geothermal Beach (near Reykjavik and warm enough to swim in!). Just loungin' on the beach casually. Reykjavik - People often skip the capitol city of Iceland in their desperation to get to anything outside (ahem…that’s what I did my first day). But there is something to be said for wandering through Reykjavik in the daytime and then again at nighttime. It’s kind of crazy how it changes! Yes, you’ll pay too much for beer. But it’s worth at least a meander. If you want another (relatively) big city along the Ring Road, be sure to stop in Akureyri. Hallgrímskirkja church peeks out at you from everywhere! Northern Lights Hunting - We wanted to see the Northern Lights badly. Almost too badly. These lights are a fickle beast and you should know you just have to let it happen. I kept pointing out wispy clouds as dusk fell thinking maybe that would be it. Hint: it’s not it. You’ll know ‘em when you see ‘em. And to see them (especially in October), I suggest heading up North! As a bonus, there are tons of tracking websites. If you do happen to take a tour, know that many will give you a second chance the next night. So if you can make it work, don’t do it on your last night! Game of Thrones Sites - Honestly, I remember Paul and I sitting on a guesthouse bed deciding whether or not to do the whole Ring Road. Our deciding factor? It’d be really cool to see some Game of Thrones filming locations…Remember the cave where Jon and Ygritte spent some time? Search for Grjotagja. The Hveraströnd Sulphur Springs produce lots of steam that has been used as GOT blizzard effects. Also, remember that Golden Circle bullet? Þingvellir National Park has some filming locations too! 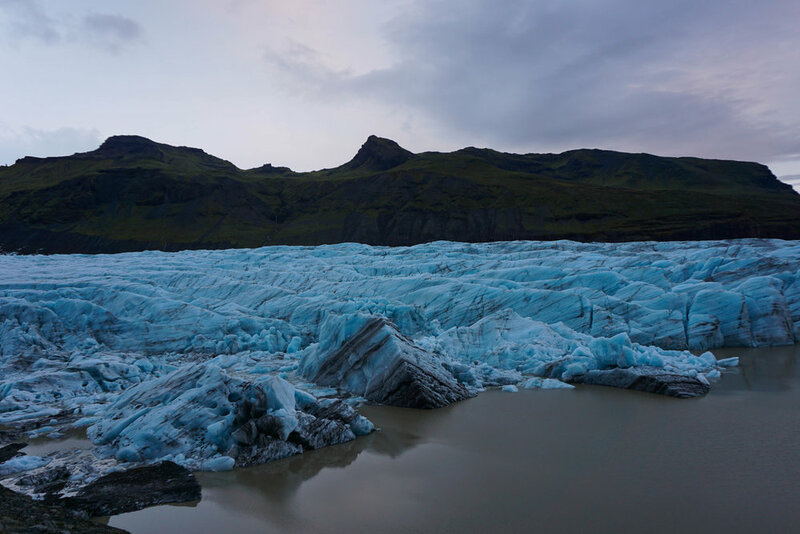 Ice Climbing & Glacier Walking - Outdoor activities are my main game when I’m on a trip and I would LOVE to go on a glacier exploration trip in Iceland. Well. I’d like to go on a glacier exploration trip regardless of the location, seeing as they’re all disappearing, but I digress. I’ve seen a couple of companies that lead combo tours, so I would be all over this should I go again! I skipped this last trip because I didn’t have the right clothing…like at all…but then I found out some companies do rent out warm gear. So do your research! Mývatn Nature Baths - I already told you how much I loved hot baths, but this is the one that got away. I describe this as an in-between. Not quite Blue Lagoon popularity (or prices) but the amenities that some of the baths listed earlier don’t have. Paul and I did get out of the car here but were too protective of our pennies to splurge. I’m not saying I regret that, but I really wish I had done it. Ha! Puffin & Whale Spotting - Here’s the negative about traveling in October: it’s not prime wildlife time! The puffins have already moved on and the whales aren’t as active that time of year. It looks like summertime is the best time for spotting these creatures! Even without puffins or whales, you'll still see plenty of Icelandic horses. Stop and pet them all! Skaftafell/Vatnajökull National Park - This one got nixed in favor of us continuing around the whole Ring Road, but there are a few hiking trails in this national park that I would be ALL over should I go back. You’ve got glaciers, you’ve got volcanoes, you can’t go wrong. From what I remember there are trails varying in difficulty, so you can probably find a happy medium for your group. The Highlands - My tiny rental car was NOT allowed to go in the Highlands, but I would most definitely grab a 4x4 and head there on my next trip to Iceland. There are (even more) seriously spectacular landscapes in there (according to Instagram) and I’d like to try my hands at driving those F roads! My most wanderlusted-after adventure? The 55km Laugavegur Trail, dumping you in Landmannalaugar. I hear it is seriously beautiful. I knew a lot of people were visiting Iceland. I guess I didn’t know quite how many people were visiting Iceland, though. I had a chat with many of my AirBnB hosts discussing how they felt about so many people visiting their home country. There were 334,252 people counted as living in Iceland in 2016. 1.7 million people visited Iceland in 2016. That’s over five times the amount of people that actually live in the country. And those people that live in the country (at least the ones I talked to) are a little worried about the lack of infrastructure to support all of those visitors. One woman in particular (remember Stina's AirBnB?) cited how few hospitals there are in the country and how many travelers tend to hurt themselves or need medical help. Another sign informed us of another probably you get when that many people camp out. But the biggest concern they have is for their landscape. With 1.7 million people traipsing across a land that you love, not all of them are bound to follow the Leave No Trace Principles. So if you go to Iceland, PLEASE for the love of this earth, take care of Iceland. It’s disrespectful not to! P.S. Want even more Iceland talk? You might want to check out my podcast episode with Stephanie - we both loved the country and she talks about how she found lots of creative inspiration there.